The TN100 Turbidimeter from Eutech Instruments is the ideal meter for on the go turbidity measurement. It comes complete with a handy carrying case, calibration kit with 4 calibration standards and 3 sample vials. 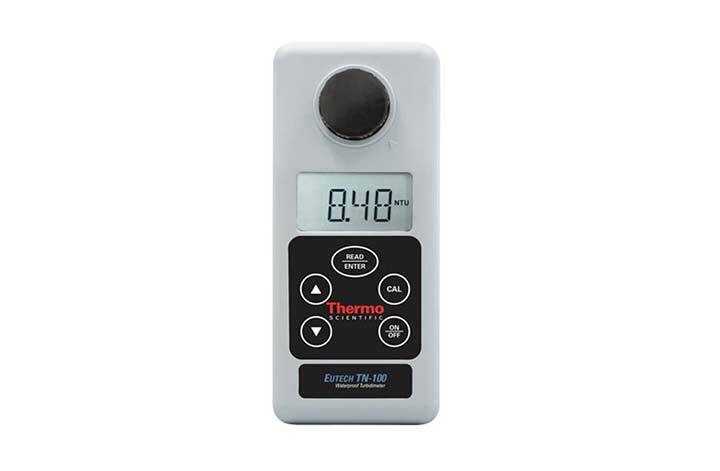 This waterproof IP67 rated meter uses an infra-red light source to provide laboratory accuracy with a resolution of 0.01 NTU across an extended range of up to 20 NTU. Calibration is easy with the 4-point push-button calibration. Readings are easily viewed on the large display with user-friendly message codes making troubleshooting easy. From a single set of AAA alkaline batteries, the power saving feature of the TN 100 allows over 1200 measurements to be taken. The TN100 is covered by a two year meter warranty.